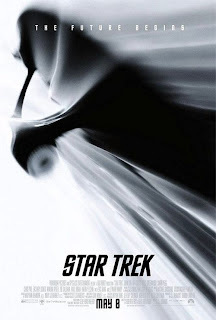 Those expecting the enticing philosophical quandaries and dialogue-heavy intellectualism of Gene Roddenberry’s original Star Trek are going to find themselves stuck for words, English or Klingon, in which to make sense of J.J. Abrams’ giddy reinvention of the classic sci-fi property. Doing away with the relentless and occasionally irksome talkiness which dragged down the series’ worst film entries – specifically 2002’s dreary Star Trek: Nemesis – the director has instead embraced the whizz-bang adventure style prevalent in George Lucas’ galaxy far, far away. In movie-speak (ala She’s All That, no less! ), the unpopular, smart, pretty wallflower with the thick glasses and ponytail has been replaced by a sexed-up beauty who, while perhaps less absorbed with questions both scholarly and philosophical in nature, still manages to epitomize enough of the original’s better qualities to warrant spending an evening (or afternoon) with. Opening, in fittingly epic form, in the distant year 2233, Abram’s Trek beams us aboard the USS Kelvin as she encounters a deep-space mining vessel captained by a pissed-off Romul an named Nero (Eric Bana). When negotiations go awry, and the Kelvin’s captain is killed, young first officer George Kirk is forced into the unpleasant leadership position, and charged with heroically saving the lives of his crew and passengers – which includes his wife, who’s in labour with his son, Jim – at the cost of his own survival. Twenty-or-so years later, young Jim Kirk (Chris Pine) has grown into a stubborn, bar-fighting ruffian who, despite a distinguished academic career, seems destined to forever stand in the shadow of his valiant father. 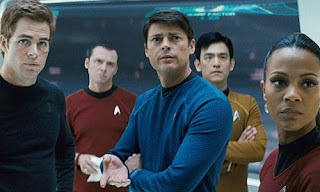 Nevertheless, after an ear nest conversation with the distinguished Captain Pike (Bruce Greenwood), he enrols, and excels, in Starfleet Academy, where he meets the snarky Dr. Leonard “Bones” McCoy (Karl Urban), the sultry and secretive Uhura (Zoe Saldana) and, most importantly, the half-human, half-Vulcan prodigy Spock (Zachary Quinto), who instantly detests Kirk’s free-wheeling attitude. 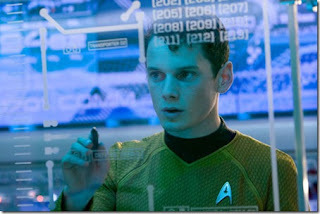 After first assignments are given out, Kirk casually defies his orders and sneaks upon the newly-constructed USS Enterprise, drawing the ire of both Captain Pike and Spock. However, after Nero rears his ugly head once again, Jim is called into action as the Enterprise is unceremoniously tasked with thwarting the villain’s planet-annihilating revenge plot, a mission which quickly leads to the ship being struck Captain-less. As Spock firmly takes over the helm, the cocky Kirk must battle foes, both internal and intergalactic, on the path to achieving his own glorious destiny as the future captain of the Enterprise. If nothing else, the zippy entertaining thrills of Star Trek proves that Abrams is one hell of a masterful motion-picture showman. Working with an often clunky script by the ham-fisted duo Roberto Orci and Alex Kurtzman – who previously conjured up the idiotic, witless Transformers – the director lithely tap-dances right over cavernous plot-holes, head-scratching contrivances and a possibly brain-damaged one-note villain by focussing on his charming cast and paying almost obsessive attention to finding excitement within every single moment. Whether in seat-rattling action scenes, as when Kirk and Sulu (John Cho) engage in a frantic tussle with Romulan thugs atop a gargantuan drill, or during the many exchanges of character-driven rapid-fire banter, Abrams’ steady direction rarely falters . 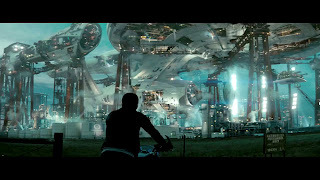 Although I can quibble over his need-for-speed mentality - the Enterprise’s introduction feels glossed over, never approaching the sense of wonder produced by earlier films – and use of blinding lens flares in eighty-percent of the film, it’s impossible to argue that the director, while perhaps not yet a visionary artist, is a premier purveyor of electric, bubble-gum-pop extravaganzas. While Abrams’ deserves kudos for his Dilithium crystal-polished technical know-how, he also proves to have a flawless eye for casting. The on-screen chemistry of the entir e Enterprise crew vibrates with vivacity, and each of the actors finds the organic truth of the original performers without stooping to idle impersonation. As James T. Kirk, Chris Pine is a revelation. Full of verve and cool, but also a very moving poignancy, the actor charismatically steers his first big-budget vehicle with aplomb and seems, like his character, destined for great things. Quinto, as Spock, is more turbulent than the lovable Zen-robot original, but instils his character with a previously unseen level of palpable internal struggle which allows for an affecting arc. Also fun are Urban’s McCoy – all testy professionalism, Anton Yelchin’s agitated Russian kid-brainiac Chekov and Simon Pegg’s manically ultra-competent Scotty. In mixing these dazzling elements with eye-popping space-battles, clever in-jokes – including a hilariously horrific red-shirt de ath, as well as a green-painted Rachel Nichols. Mmmm. – and even the significant presence of Leonard Nimoy himself (speaking wheezy expository dialogue with the majesty and dedication usually reserved for performing Henry V) Star Trek is an often sensational space spectacle. Here’s hoping, though, that its success leads to a more audacious and cerebral sequel. You’ve nailed the launch, Mr. Abrams, now take her to warp speed!!! *Originally printed in SFU's The Peak: May 18th, 2009.